This lemon pasta recipe is perfect for summer! It is so easy and done in 30 minutes. 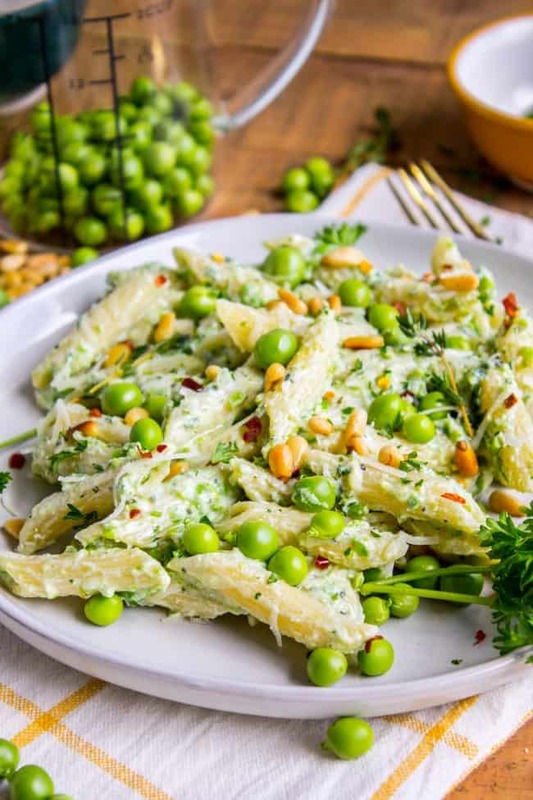 The cheesy sauce is made by blending ricotta with peas and lemon. Top it with Parmesan and garden fresh peas, and you have a hearty vegetarian dinner! It’s so good! I just sprayed my entire kitchen and my entire outfit with almond butter. 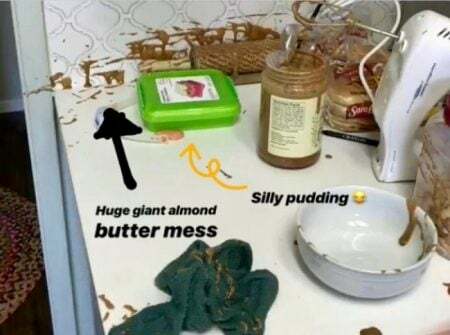 You know how almond butter separates and gets all oily on top? I was following a tip from someone who said you can use a hand mixer to stir it up. Great idea right?? Right…… Just don’t do it while trying to film a story for Instagram. This is like Hand Mixer 101 guys. Hold onto the bowl (not your phone) while mixing. FAIL! But I promise this pasta will be fine without it. 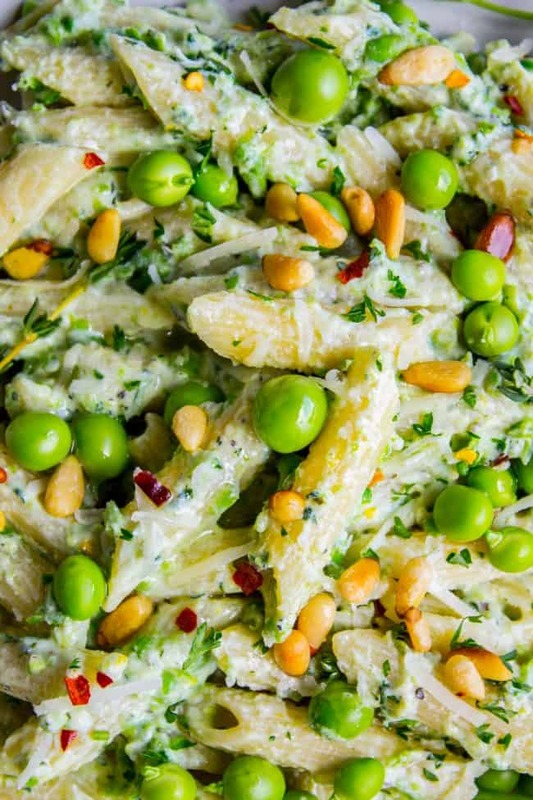 The ricotta-pea combo makes for a very satisfying pasta sauce. You could definitely pair it with some grilled chicken to round out your meal if you like, or throw in some shredded rotisserie chicken. OOH! Or I just thought of this, I bet a sprinkle of crumbled bacon on top would be delicious too! Bacon’s always a good idea. Another great thing about this lemon pasta is that it doesn’t skimp on the sauce. You know there’s nothing worse than dry pasta…but look at that cheesy mess. I bought some fresh peas at the farmer’s market this week, which I realized I have never even cooked with before. How, why?? I’m no gardener and I’m so cheap that I never think to buy them. It cost $4.50 for 1 pound of fresh peas, and by the time I shelled them I had exactly one cup of fresh peas. They were SO good though. 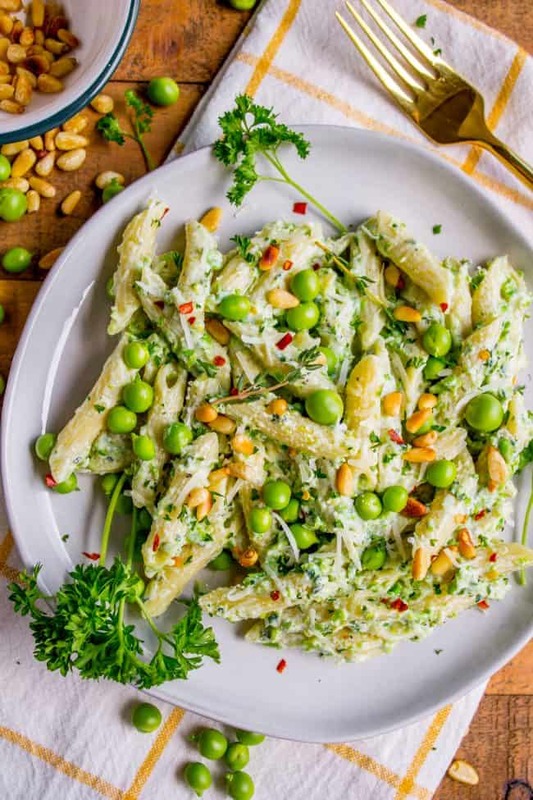 But don’t worry, you can make this pasta with frozen peas (don’t use canned, it’s an offense to vegetables the world over.) I used frozen peas (that I had thawed quickly in the microwave) in the sauce that I blended up, and saved the fresh peas to add at the end. Fresh or frozen, this pasta is going to taste amazing! If you can get your hands on 1 cup of fresh peas, even better! You could serve this with Garlic and Rosemary Skillet Bread and these Roasted Carrots with Dill! That would be such an amazing dinner! 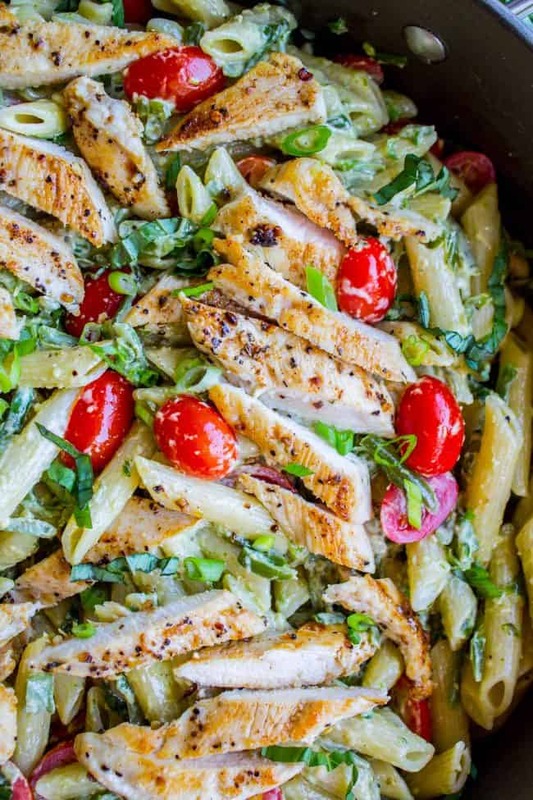 This lemon pasta recipe is perfect for summer! 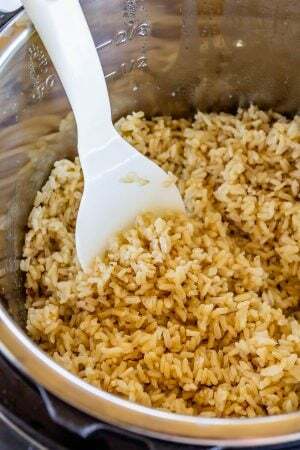 It is so easy and done in 30 minutes. The cheesy sauce is made by blending ricotta with peas and lemon. 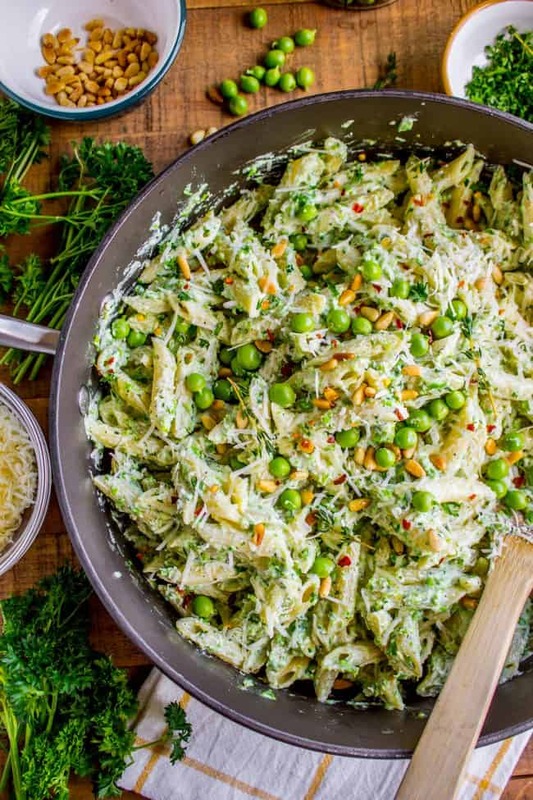 Top it with Parmesan and garden fresh peas, and you have a hearty vegetarian dinner! Once the pine nuts are toasty and golden and fragrant, remove to a plate and set aside. Fill the high sided skillet with water and add 1 tablespoon of salt (it should taste like seawater.) Bring to a boil over high heat. Add the pasta and cook, stirring occasionally, until al dente. It should only take about 10 minutes, but check the package. Don't overcook it. Nobody likes limp noodles. When the pasta is al dente, drain in a colander and return to the same pot. 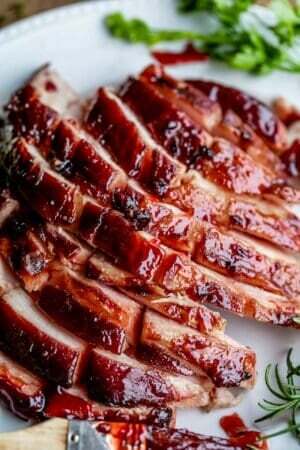 Drizzle with olive oil and stir. Meanwhile, make the ricotta pea sauce. 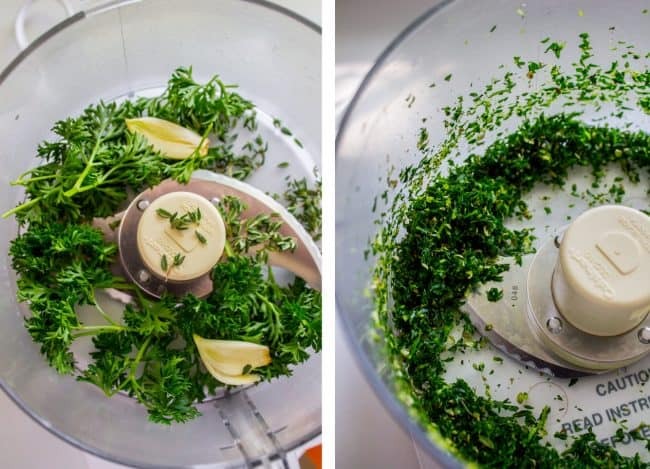 In a food processor or blender, add garlic and a bunch of parsley*. I didn't measure this, just throw in what looks like it will be 1/3 cup. Add oregano and thyme, and pulse or blend until the parsley and garlic are finely chopped. Add 1 and 1/2 cups peas, the ricotta, the lemon zest and juice, 1/4 cup olive oil, 2 teaspoons kosher salt (see note), and black pepper. Pulse until the mixture comes together but still has some texture to it, it shouldn't be completely smooth. Add the ricotta mixture to the pasta and stir it up. Add the remaining cup of peas. Add 1/2 cup grated Parmesan and a few drizzles of olive oil. You can add this to the pot or over each individual serving. If you are serving adults, add a few shakes of crushed red pepper, or if you are serving kids leave it out (or just add a little). Top each serving with some toasted pine nuts. *If you are using table salt, start with 1 and 1/2 teaspoons and go up from there. Don't be shy. I don't drink alcohol, but one of the reviews on the original recipe said that this is best served with a crisp white wine. If you are using fresh peas, pop a few in your mouth to make sure you like them raw. If it's not your thing, you can add the peas to the cooking pasta for the last 1-2 minutes of boiling. No more than that! You don't want them to get mushy. Frozen peas are always blanched before they are frozen, so no need for this step if you don't have fresh peas. 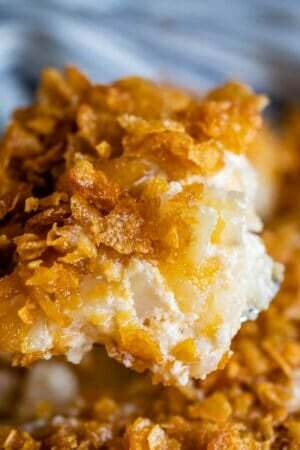 This recipe is from MyRecipes.com, it originally appeared in Sunset magazine. More easy pasta recipes to try out! 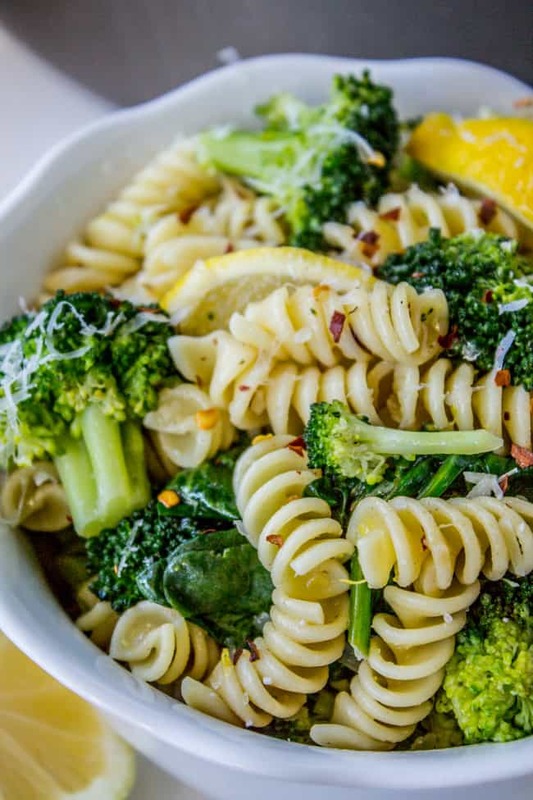 20 Minute Lemon Broccoli Pasta Skillet << this recipe is a fan favorite! 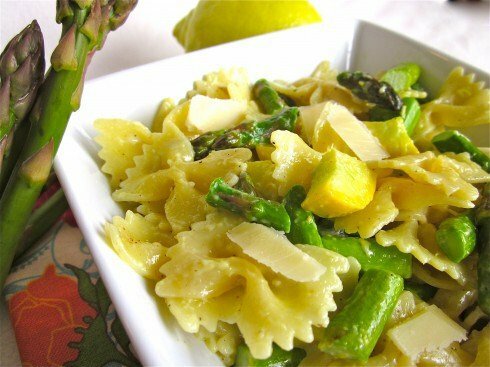 Garlic Asparagus and Pasta with Lemon Cream << this is an oldie but a goodie. 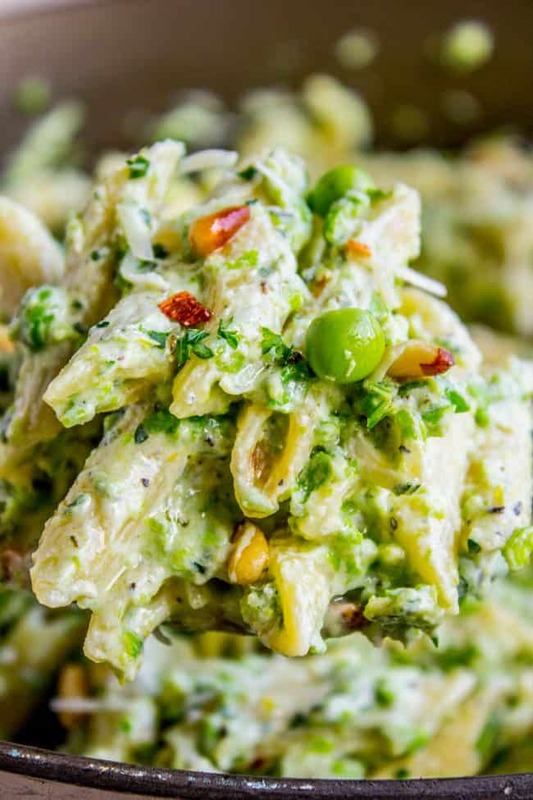 More easy pea pasta ideas you will love! Hi Joy! No, I just put them in raw! If they are frozen, thaw them first :) Enjoy! 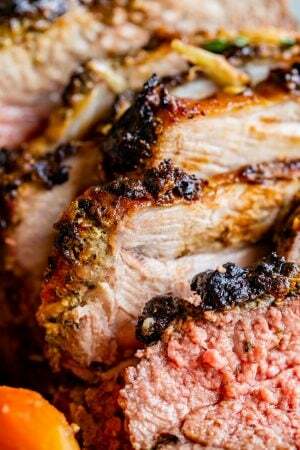 I can not even express in words how much mu husband and I love this recipe! It’s fantastic! The creamy cheese with the flavorful parsley!! Yum! This recipe works great for my husband because he hates the texture of peas so I blend them all up then add extra on top of mine. Thank you for the super tasty recipe! We make it for date night on a regular basis! I’m so glad you like it Sarah! Perfect adaptation for your husband who’s not a pea fan. Thanks for commenting with the idea! I really liked this. I didn’t have fresh peas and I was too lazy to get bacon to add (though that would have been great), but I bought fresh ricotta at the farmer’s market and it made a great dinner! Ooh this would be amazing with fresh ricotta! I should look for some next time I’m at the farmer’s market! Great idea. Thanks Kathy! OMG! I could just sit and eat the sauce with a spoon by itself! I can never not tinker with a recipe so I used garlic scapes instead of the dried cloves, 8 oz of Chevre (my son hates ricotta which is beyond understanding! ), and Tofette ( a large shell type pasta that I thought could coyly hide the fresh raw peas and pinenuts just for fun. I plan to try it cooler (it’s unusually hot here today!) and I’m sure it will be scrumptious! Thank you! Anna, that sounds amazing! I love the idea of making this with Chevre. Also I love that your son likes Chevre but can’t handle ricotta, which is not nearly as potent! So funny. Thanks for your comment! I will try this out but I feel like if you serve it cold it should be more of a side than a main, but that’s just my opinion. Let me know what you end up doing!! Hope you love it. I am in the process of preparing you recipe and was wondering can this dish be served cold? And if cold can it assembled the day before? Hey Betty, I served this warm, but when I ate the leftovers I ate it cold. I like it both ways. The presentation will be prettier if you make it fresh and serve it warm, but if you want to make ahead of time and serve cold it would still be good. I feel like if you serve it cold it should be more of a side than a main, but that’s just my opinion. Let me know what you end up doing!! Hope you love it. Hmmmm that’s a toughie Lindsey. I’m wondering if you could do goat cheese. It would be VERY strong though and change the flavor quite a bit. Maybe you could do have goat cheese, half cream cheese? It would be delicious I think, but again, goat cheese is waaay stronger than ricotta. Or maybe you could just try replacing with cream cheese. Let me know what you end up trying out!! Just a thought, but do you have digestive issues with cottage cheese? You could blend it in a food processor for a smooth texture, might be a closer substitute for ricotta? Good idea Amelia! Thanks for the input! Dear Karen, I truly enjoy your works. Thank you so much for this one ! This looks so yummy, for sure will be on the table next Meatless Monday. Hahaha!!! I guess I’ve had Ricotta’s gender wrong all these years!! LOL! Mostly I’m just pleased that someone else has an opinion about such an important topic ;) I hope you love the pasta Monica!! Thanks for the comment and the laugh! I just found your site today. I have to say I’m impressed. 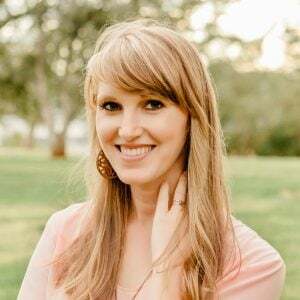 I love the bright colorful photos (I’m a photographer, so I’m biased!) and the easy to follow instructions. Thank you! I’m always on the lookout for new and interesting ideas! Hey Brian! Thanks for the compliment! I followed your link, your photos are great too! If I could ever get the humans in my photos to look like that, my life would be complete ;) I can only take pictures of food. haha! Let me know which recipes you end up trying out!